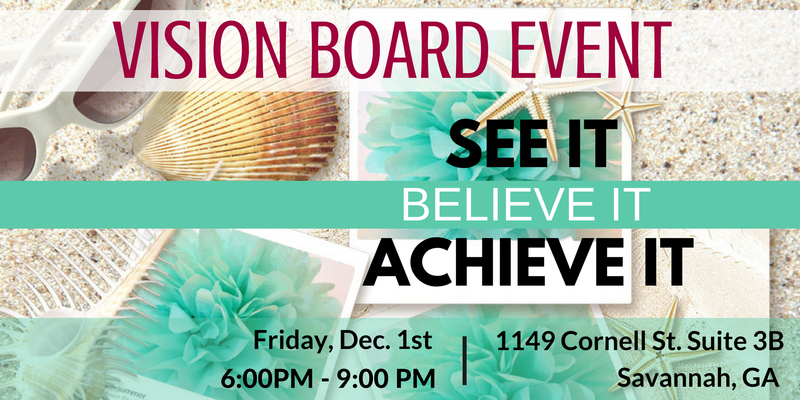 Our vision board events are filled with amazing women seeking clarity on how to change and enhance their lives. We’ve designed a fun night of leading you through defining goals and then creating a visual representation of them. You leave feeling energized, focused and ready to realign your intentions to truly rockin’ 2018. You have one assignment after the class.. to put your vision board in a place where you’ll see it EVERY day. This is not a one time deal to manifesting an alternate reality. This workshop is the first step in aligning your focus to your goals. I host a lot of business classes where I teach people how to grow businesses and corporate organizations. I love business and I love teaching. With that said, I LOVE the vision board workshops because attendees come with a level of transparency that is inspiring. Every person who has attended one of my vision board workshops has come READY for RESULTS. If you’re ready for results, register TODAY and I’ll see you Friday, December 1st.